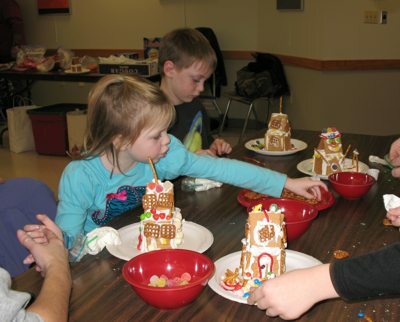 The very successful Graham Cracker House Program presented by Explore & More was held on Saturday, December 6th at the Grand Island Memorial library. Over 100 children and their families enjoyed this program which was sponsored by the Friends of the Grand Island Memorial Library. This is the eleventh year for this holiday tradition at our library. Make your own Graham Cracker House will be presented by Explore & More at the Grand Island Memorial Library on Saturday, December 6, 2014. There will be two sessions: 2:00 pm and 3:00 pm. Space is limited and registration is required. When registering please specify which time you prefer. All ages are welcome, however, we ask that parents accompany children ages 6 and younger to the program. To register, or for more information, call 773-7124 or visit the library. This program is funded by the Friends of the Grand Island Memorial Library. The VNA will offer Flu & Pneumonia Vaccinations at the Grand Island Memorial Library on Saturday, November 29th from 12:00 p.m. to 3:00 p.m. Bring your insurance card. The Grand Island Memorial Library will be closed on Tuesday, November 11 in observance of Veteran�s Day. Pictured left to right in front of the new sign: Library Trustees Pat Rizutto and Barbara Birt, Friends President Mary Cooke, Sarah Becher, Library Director Lynn Konovitz, Town Board Liaison to the Library Trustees Richard Crawford, Candy Broman and Library Trustee and Friends Board Member Jill Banaszak. On Saturday, November 1st, the Grand Island Memorial Library celebrated 25 years on Bedell Road with a special children�s program, anniversary cake and official recognition of the new sign. 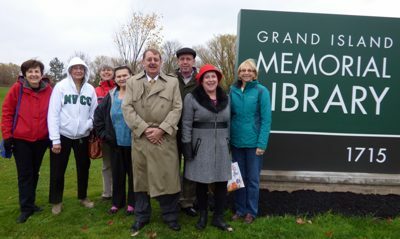 The Grand Island Memorial Library Sign project was a joint effort among the Town of Grand Island, the Library Trustees, the Friends of Grand Island Memorial Library and several community members. Friends of the Library member Sarah Becher brought the idea of a new sign to a Friends meeting at least two years ago, after she sat in traffic on Bedell Road, noticed the poor condition of the library sign and brought to the next meeting a list of several sign companies and examples of their work. Grand Island�s ASI Signage was instrumental in the project.� Owners Andy and Bethany Bernatovicz and Keith and Shawna Joslyn became part of the team and helped the group identify the type of sign best suited to the Library�s needs. 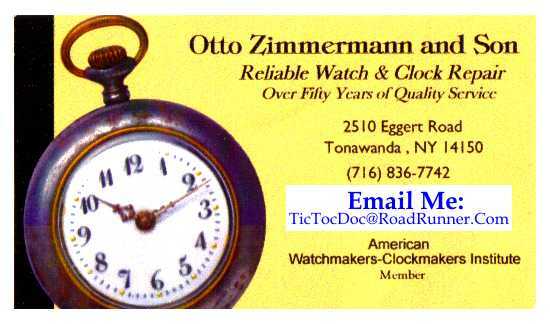 �A tour of their business at 2957 Alt Blvd. included a session about types of signs and different messages sent by various designs.� This educational effort helped both Library Trustees and Friends of the Library make the best choices for the new sign.� ASI also gave the group a great price on the job, donating a large amount of time and materials. Friends member Candy Broman organized the schedule and worked diligently to keep the project progressing. Clive Roughsedge was unable to attend on Saturday but was recognized for donating his time and talent to complete the masonry for the base of the sign. The Friends of the Grand Island Memorial Library will present a Discarded Book Sale at the library on Friday, November 14th from 10:00 am - 5:00 pm and on Saturday, November 15th from 10:00 am - 3:00 pm. There is a fill a bag for $2.00 sale from 1:00 - 3:00 pm. For more information, visit the library or call 773-7124. The Grand Island Memorial Library will be open Tuesday November 4th, Election Day, for its regular hours. 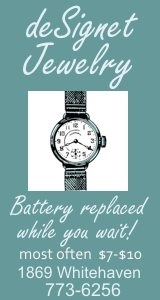 The library will open at 10:00 a.m. and close at 9:00 p.m. There will be no Pre-school Story Hour that day. The Grand Island Memorial Library, 1715 Bedell Road, will celebrate its 25th Anniversary on Saturday, November 1st. The community is invited to visit the library which will have a special family program at 2:00 p.m. featuring Charlie of "Charlie and Checkers". Refreshments will be served. For more information, visit the library or call 773-7124. On Columbus Day, October 13th, the Grand Island Memorial Library will be open from 10:00 am � 9:00 pm. A special program will take place on October 13th at 2:00 p.m. "Inventions out of Junk", a creative program for children ages 8 � 12 will meet in the library�s meeting room. Each participant will use their imagination to create an invention out of junk. 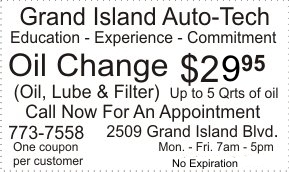 The Friends of Grand Island Memorial Library are sponsoring a new library card raffle. Anyone who signs up for a new library card, 1715 Bedell Road, will be entered into a raffle for a children's prize pack or adult $25 Barnes and Noble gift card. The drawing will be held after the 2:00 p.m. program at the library on October 13th. The library will present "Creatures of the Night" on Tuesday, October 21st at 6:30 pm, an evening story time for children ages 3 � 6. Space is limited and registration is required for each of these programs. For more information, call 773-7124, or sign up at the library. 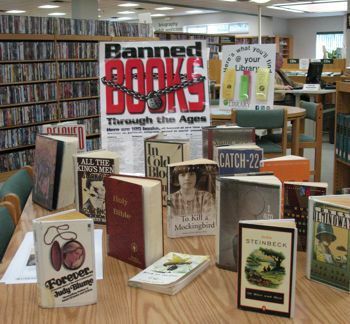 Visit the Grand Island Memorial Library during Banned Book Week 2014 to view our display of books past and present that have been banned over the years. There will be a Fall Session of the Preschool Story Hour at the Grand Island Memorial Library featuring stories, songs and crafts for children 3 to 5 years old. Children must be 3 years old by September 22, 2014. The program will be held on Monday mornings, from 10:30 a.m. to 11:30 a.m. beginning on September 22 and on Tuesday afternoons from 1:30 p.m. to 2:30 p.m. beginning on September 23. Registration is required. To register, or for more information, call 773-7124, or sign up at the library. There will be a Fall Session of the Toddler Time Lapsit at the Grand Island Memorial Library featuring stories, songs and fingerplays for children 18 months to 3 years old. Each child must be accompanied by an adult caregiver. Children must be 18 months old by October 1, 2014. The program will be held on Wednesday mornings, from 10:30 a.m. to 11:00 a.m. beginning on October 1. Registration is required. For more information, or to register, call 773-7124, or sign up at the library. Learn the skills of a savvy online shopper. An introduction to streaming and downloading digital music and podcasts. An introduction to the iPad. Please bring your iPad to class. Discover a variety of the best Apple and Android apps. Please bring your fully charged Apple or Android device (with passwords) to class. The Grand Island Memorial Library will be closed on Monday, September 1st in observance of Labor Day. The library will be open on Saturdays beginning September 6th. 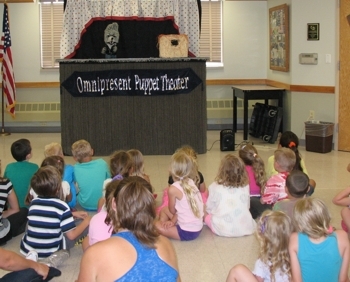 Over 70 children and their families enjoyed The Three Little Pigs presented by the Omni Puppet Theatre on Wednesday, July 23rd. The Grand Island Memorial Library Book Club will have the author of their July book selection, Thomas Reigstad, discussing his book, "Scribblin' for a Livin': Mark Twain�s Pivotal Period in Buffalo", on Monday, July 28th at 7:00 p.m. in the library�s meeting room. The public is invited and refreshments will be served. For more information, visit the library or call 773-7124. Friends of the Grand Island Memorial Library book sale room will be open on Friday, July 11th and July 25th from 11:00 a.m. � 1:00 p.m. and on Thursday, July 17th and July 31st from 6:00 p.m. � 8:00 p.m. 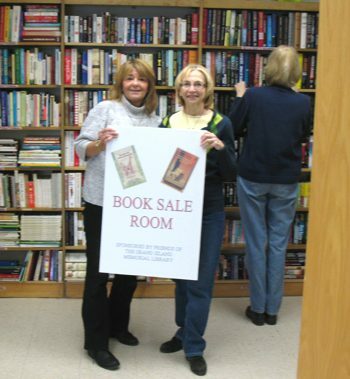 Proceeds from the book room benefit the Grand Island Memorial Library. The Grand Island Memorial Library has announced its summer hours beginning Monday, June 16th and ending Labor Day. 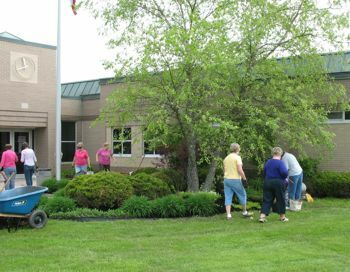 OPEN Monday and Tuesday 10:00 a.m. to 9:00 p.m.
Members of the Cinderella Garden Club gathered on Thursday, May 22nd to spruce up the landscaping surrounding the Grand Island Memorial Library. The Grand Island Memorial Library will be closed on Monday, May 26th in observance of Memorial Day. 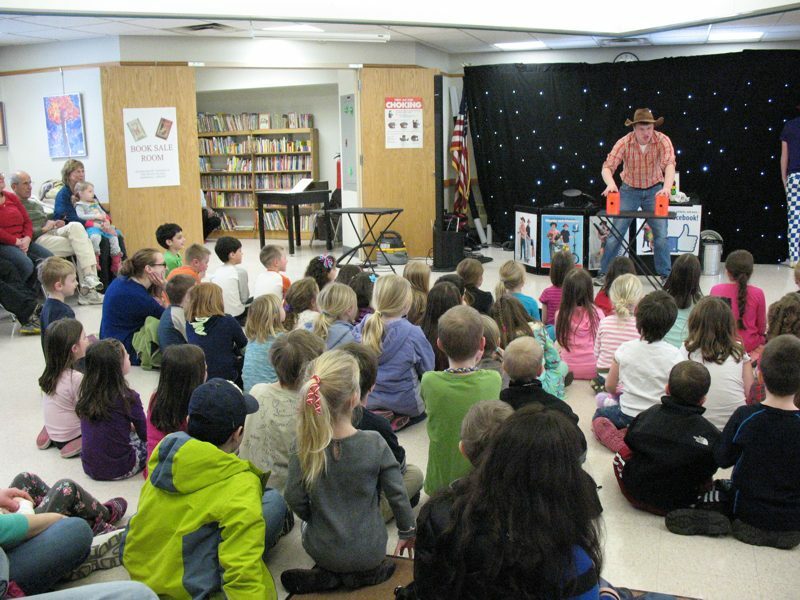 In celebration of Children�s Book Week, The Grand Island Memorial Library is proud to present the Gravitational Bull Juggling Show on Saturday, May 17 at 2:00 pm. All ages are welcome, however we ask that children ages 6 and under be accompanied by an adult. Registration is not required. For more information, call 773-7124, or sign up at the library. The Grand Island Memorial Library will hold a Stuffed Animal Story Time, on Thursday, May 1 from 6:30 � 7:00 pm. This program is for children ages 3 to 8 featuring stories, games, crafts and more. Kids are encouraged to bring their favorite stuffed animal to the program. Children ages 5 and under should be accompanied by an adult. Space is limited and registration is required. For more information, call 773-7124, or sign up at the library. The Grand Island Memorial Library Teen Book Club will meet on Saturday, April 26 from 1:00 pm � 2:00 pm at the library. We will be discussing "Out of My Mind" by Sharon Draper. Refreshments will be served. The book club is free and open to all teens in grades 6 -12. For more information, visit the library or call 773-7124. There will be a Spring Session of the Preschool Story Hour at the Grand Island Memorial Library featuring stories, songs and crafts for children 3 to 5 years old. Children must be 3 years old by April 28, 2014. The program will be held on Monday mornings, from 10:30 a.m. to 11:30 a.m. beginning on April 28 and on Tuesday afternoons from 1:30 p.m. to 2:30 p.m. beginning on April 29. Registration is required. To register, or for more information, call 773-7124, or sign up at the library. The Grand Island Memorial Library will present Anansi�s Rainbow, a puppet show performed by the Omnipresent Puppet Theatre on Wednesday, April 16 at 2:00 pm. All ages are welcome, however we ask that children ages 5 and under be accompanied by an adult. Registration is not required. For more information, call 773-7124, or sign up at the library. The Grand Island Memorial Library will hold a Family Movie Afternoon on Saturday, March 22nd, at 2:00 p.m. All ages are welcome, however all children must be accompanied by an adult. For more information, visit the library or call 773-7124. The Grand Island Memorial Library Teen Book Club will meet on Saturday, March 22 from 1:00 pm � 2:00 pm at the library. We will be discussing The Book Thief by Markus Zusak. Refreshments will be served. The book club is free and open to all teens in grades 6 -12. For more information, visit the library or call 773-7124. 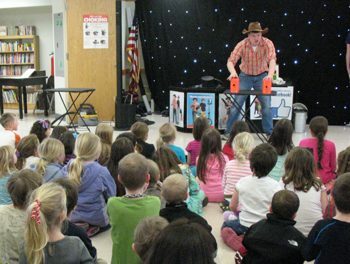 Over 125 children and adults enjoyed the antics of Charlie and Checkers on Thursday, February 20th at the Grand Island Memorial Library. From left: Carole Joseph, Jill Banaszak and stocking the shelves is Charlotte Senulis. The Friends of the Grand Island Memorial Library have a new space in the library's meeting room that will allow book lovers an opportunity to purchase books. Friends volunteers will staff the room throughout the year. The book sale room will be open when the library holds family programs and also on Saturdays from 11:00 am - 1:00 pm. Other times will be added in the future. The Friends still plan to continue holding their regular book sales. The next sale will take place on April 4 and 5. For more information visit the library or call 773-7124. The Charlie and Checkers Show will be at the Library, 1715 Bedell Rd. on Thursday, February 20th at 2:00 p.m. The show features juggling, magic and comedy. No registration is necessary and all ages are welcome, but children age 5 and younger should be accompanied by an adult. The Friends of the Grand Island Memorial Library are looking for volunteers to help them sort books for future book sales. There will be an "orientation" meeting on Saturday February 15th at 10:00 a.m. in the library meeting room. Refreshments will be served. For more information, please call the library at 773-7124. For more information, contact the library at 773-7124. The Grand Island Memorial Library will hold a Family Movie Afternoon on Saturday, February 8th, at 2:00 pm. All ages are welcome, however all children must be accompanied by an adult. For more information, visit the library or call 773-7124. The Grand Island Memorial Library Teen Book Club will meet on Saturday, February 8 from 1:00 pm � 2:00 pm at the library. We will be discussing "Dare You To" by Katie McGarry. Refreshments will be served. The book club is free and open to all teens in grades 6 -12. For more information, visit the library or call 773-7124. There will be a Winter Session of the Toddler Time Lapsit at the Grand Island Memorial Library featuring stories, songs and fingerplays for children 18 months to 3 years old. Each child must be accompanied by an adult caregiver. Children must be 18 months old by January 29, 2014. The program will be held on Wednesday mornings, from 10:30 a.m. to 11:00 a.m. beginning on January 29. Registration is required. For more information, or to register, call 773-7124, or sign up at the library. There will be a Winter Session of the Preschool Story Hour at the Grand Island Memorial Library featuring stories, songs and crafts for children 3 to 5 years old. Children must be 3 years old by January 27, 2014. The program will be held on Monday mornings, from 10:30 a.m. to 11:30 a.m. beginning on January 27 and on Tuesday afternoons from 1:30 p.m. to 2:30 p.m. beginning on January 28. Registration is required. To register, or for more information, call 773-7124, or sign up at the library. The Grand Island Memorial Library will host eReader One on One sessions to assist patrons with borrowing electronic books from the library. Sessions will take place on Saturday, January 18 from 10:00 am to 1:00 pm. Patrons can meet with Library Staff for a free 45 minute appointment to learn how to borrow Library eBooks for eDevices (Kindle, Nook, iPad, and Android Tablet.) Please bring your Library card, any usernames and passwords associated with your device as well as its USB cord, if applicable. These sessions are open to Library patrons age 17 and above. Registration is required. For more information call 773-7124 or visit the library. The Grand Island Memorial Library Teen Book Club will meet on Saturday, January 11 from 1:00 pm � 2:00 pm at the library. We will be discussing "Things Not Seen" by Andrew Clements. Refreshments will be served. The book club is free and open to all teens in grades 6 -12. For more information, visit the library or call 773-7124.